An attempt to compel President Jacob Zuma to appoint a commission of inquiry into a controversial arms deal was postponed at the Constitutional Court on Thursday. Chief Justice Sandile Ngcobo said it would be heard on September 20. This is to enable the president to file a response to facts contained in the application by Terry Crawford-Browne, who wants the matter probed. Earlier the hearing spluttered to a halt after President Zuma’s legal team said the application was of a technical nature and it needed more time to ponder the facts. This was because the president decided to focus on the legal technical aspect of retired banker Terry Crawford-Browne’s application for direct access to the court and did not file an affidavit responding to factual claims in the application. The court also heard that the reason for the last refusal in 2008 to appoint a commission, by former president Kgalema Motlanthe , was given as due to an ongoing investigation by the now defunct Scorpions. But the Scorpions were subsequently disbanded. 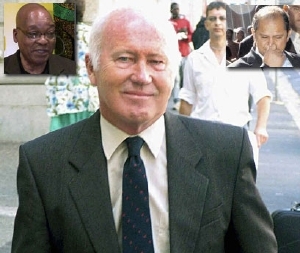 There is currently no investigation into aspects of the multi-billion rand deal which at one point saw Zuma himself facing a trial for corruption for allegedly receiving a bribe from arms company Thint - allegedly facilitated by his now paroled former financial adviser Schabir Shaik. The judges said it would be unfair to decide the case based only on facts presented by Crawford-Browne and became irritable at the idea of a postponement so that Zuma could file an affidavit replying to the factual allegations. With acknowledgements to Business Day and Sapa.